This guide is to assist you in setting up SIPTRUNK.com as a Sip Trunk provider on Avaya IP Office Manager version 8.0 and above with Digest Authentication. 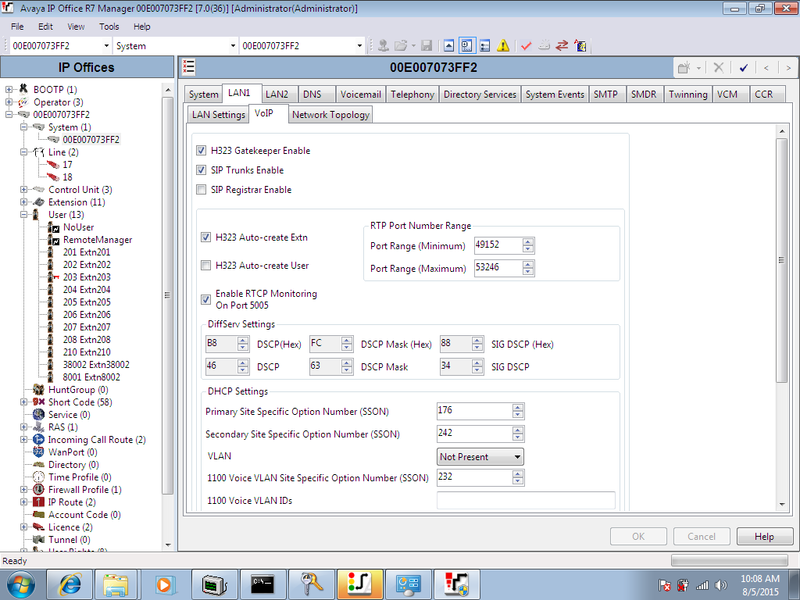 This particular configuration was done on an Avaya IP Office 500v2 with a VCM 32 card. This Avaya System was configured via Open Internet and was not behind any firewall. 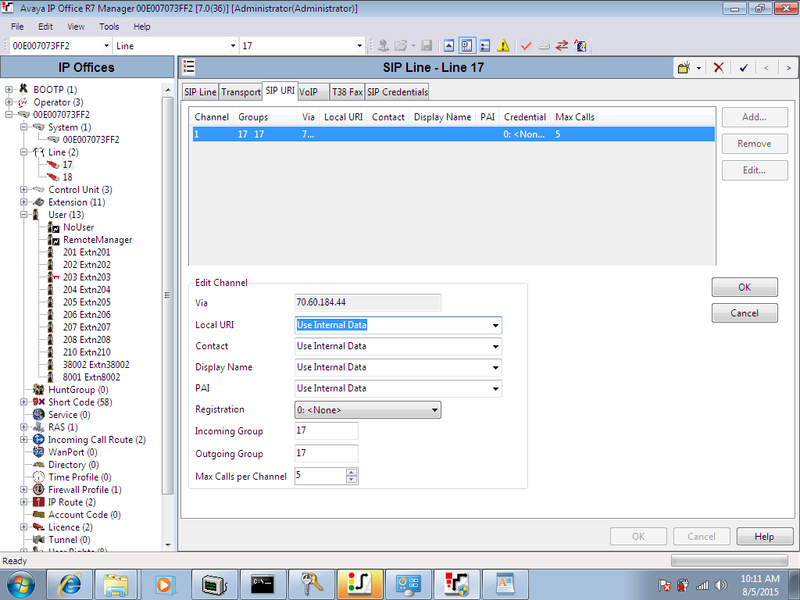 The following configuration represents a minimal configuration to provide inbound and outbound calling with a single DID and Channel at SIPTRUNK.com. It includes utilization of both gateways for fail-over capabilities as a best practice. 1. 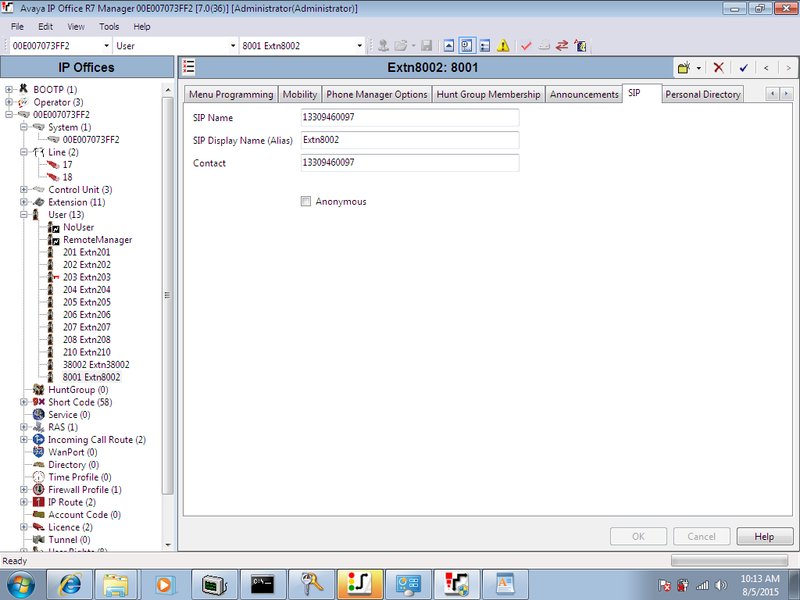 Log in and Load your configuration in Avaya IP Office Manager. 2. Go to "System" then select your IP Office System. 4. 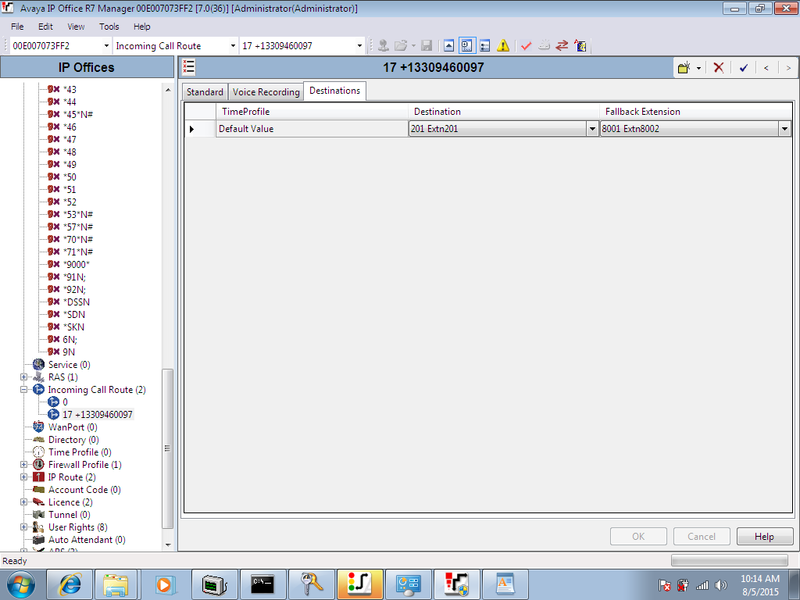 Select the "VoIP" tab and ensure that "Sip Trunks Enable" is checked. 5. 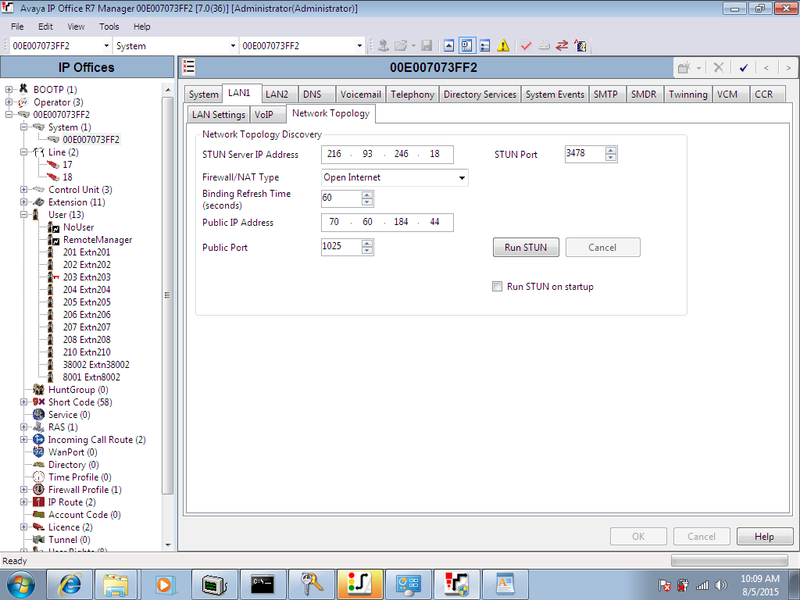 Select the "Network Topology" tab and fill in the settings to match your topology. ***This device was not behind NAT, but the STUN server address in the image is SIPTRUNK.com's valid STUN server IP. You may use it if necessary. The "Binding Refresh Time" is a setting that controls the frequency of SIP options messages. We chose 60 seconds as it provided a good result in testing. 6. Go to "Lines" then right-click and select "New" --> "SIP Line." 7. 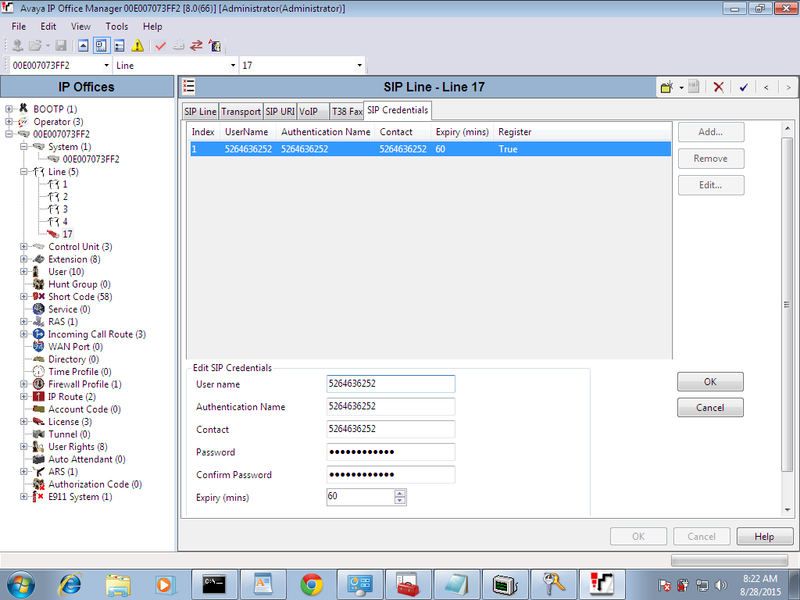 Under "ITSP Domain Name" input the gw1.siptrunk.com, select "Request URI" for call routing method, and "By Source IP Address" for association method. All other settings can be left as default or adjusted as necessary. 8. Under the "Transport" tab input the IP address shown in the image below for "ITSP Proxy Address." This is the address of gw1.siptrunk.com. Ensure that you have input valid DNS settings, Network Configuration Information, and that "Calls Route via Registrar" is checked. 10. Select the "SIP URI" tab and add an entry. The applicable settings from below are the "Incoming" and "Outgoing" groups, and the "Registration" selection. These need to match the line number that you just created and the "SIP Credentials" entry which will were entered in step 9. All other settings were left at the default. 11. Select the "VoIP" tab, then click "Advanced"
12. Ensure that only G711 ULAW and G729 are selected. 13. Check the box for "Re-invite Supported" and ensure that RFC 2833 is selected for DTMF mode. 14. 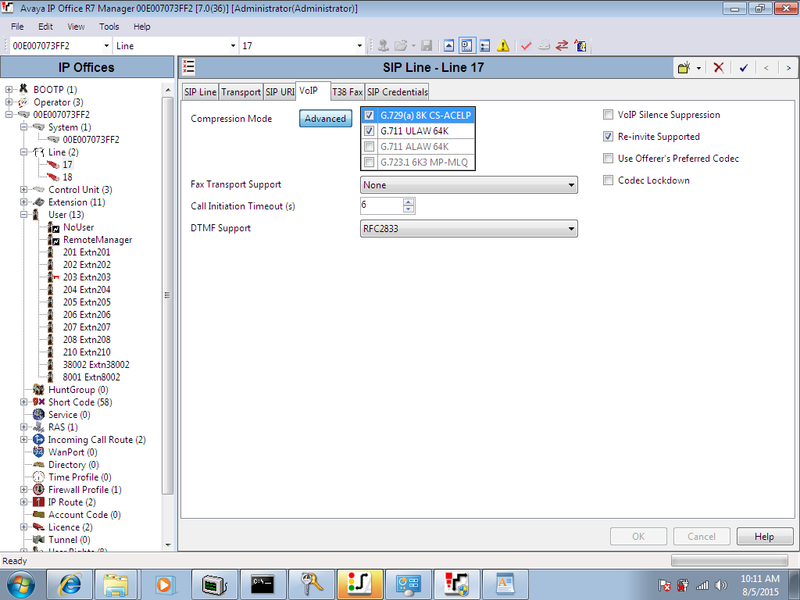 Create a second "SIP Line" and duplicate all settings except for "ITSP Proxy Address" under the "Transport" tab. The IP address in the image below is for gw2.siptrunk.com and will provide redundancy for inbound and outbound calling when configuration is complete. 15. Navigate to the "User" tree and select "No User"
16. Select the "Source Numbers" tab and add "SIP_OPTIONS_PERIOD=1" as an entry. This is an additional time based control on the frequency of SIP Options messages. 17. 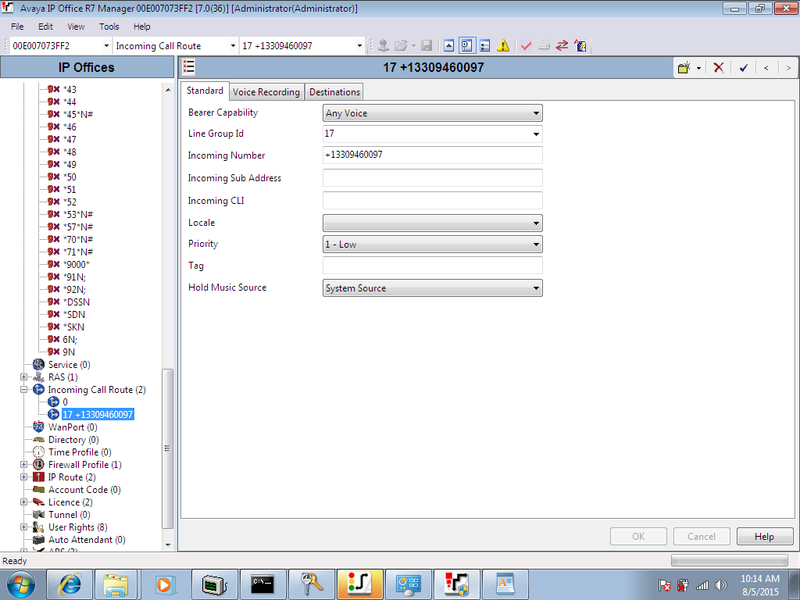 Select the User who will be dialing and receiving calls on the SIP Line and go to the "SIP" tab. Enter the DID that will be transmitted as their Caller ID under "SIP Name" and "Contact." 18. Navigate to the "Short Codes" tree and create a new short code. 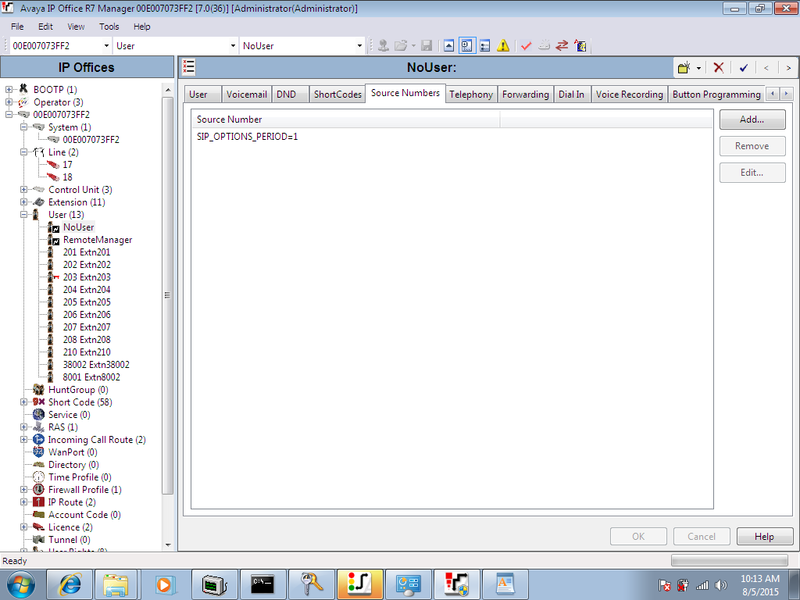 This code will be used to direct calls to the SIP Line we created. 19. Ensure that your "Telephone Number" field follows the N@"gw1.siptrunk.com" format where N=Any Number or you may specify a specifically dialed number if you wish. 20. We chose to use an ARS entry in the "Line Group" field which will be discussed in upcoming steps as it allows us to provide fail-over capabilities in-case gw1.sip.us is unavailable. You could simply skip the ARS steps and use the Line Group you previously created. 21. Navigate to the "Incoming Route" tree and create a new route. 22. Under the "Standard" tab ensure that the "Line Group" matches what you created previously and that you list the DID that will be delivered with a "+" symbol in front. 23. Under the "Destinations" tab ensure that you have set an appropriate destination for your inbound route to deliver the call to. 24. Navigate to the "ARS" tree and create a new entry. 25. Give the route a distinctive name and mark it as "In-Service." Add a code for calls to be routed through. The code pictured below transmits any number dialed through the Line Group that was previously created. 26. Note that the out of service route is directed to a second ARS group that was created using the same process outlined here, except it uses the secondary Line Group previously created. The second ARS group is also used as a lower priority "Alternate" route in this ARS group's routing. 27. Save the Avaya configuration and load it into the system. 28. Once the system reboots you should be able to make and receive calls through SIPTRUNK.com. If you experience problems after following this guide please use the link at the top right to open a support ticket.